By following some of these pragmatic steps, any uni- versity, library, or college campus can get started in the emergent area of 3D printing for their academic community. In terms of new technology services at university and college campuses, 3D printing infrastructures seem to be all the rage. If your university does not have a 3D printing lab yet, it is likely that someone on campus is thinking about one. Typically, 3D printers are being located in the university library learning commons or university campus makerspaces. The rationale is similar to the earlier PC revolution in which the computers and printers were taken out of cloistered quarters in the computer or engineering lab and introduced to a wider interdisciplinary user community in a library learning commons. Such a “third place” location promotes new and nontraditional use possibilities for learning and pedagogy. It also introduces processes that were previously open to only a very select few to a larger creative academic community. Placing a 3D printer in the library promotes a synthesis of physically disparate academic areas and disciplinary experts to work together on challenges of engineering, aesthetics, design, and learning. This article provides an overview of the lessons we learned in our 3D printer deployment and the pragmatic steps other technology directors or learning commons managers might take in implementing such a new infrastructure at their campus library. It is based on the pragmatic, real-world experience of Texas State University, a large multidisciplinary emerging research university currently completing a yearlong investigative, selection, and implementation process for establishing a new paradigm of 3D printing infrastructure. 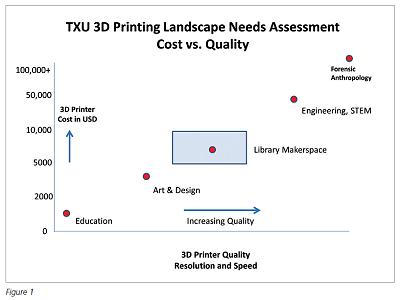 Before selecting a 3D printer and beginning the process of implementing any such infrastructure at a campus library, it is a good idea to begin with a wider environmental scan and needs assessment of the current environment on campus. Most likely, there are departments on your campus that have been early adopters and have already purchased a 3D printer for departmental or faculty use. While 3D printers are currently the next big thing on learning commons’ innovation lists, they have been around for 10 to 20 years, largely deployed in industry sectors, but also selectively on university campuses. Some departments on your campus may have even gone so far as to develop local policy and service infrastructures for their use. During our environmental scan of the university’s current 3D printer capacity, six academic areas were already using 3D printers. Such early adopter activity is a good thing; it will aid in convincing detractors and upper-level university administration that the investment is warranted, helping to assure their buy-in. At Texas State, an environmental scan and needs assessment unearthed several extant 3D printer deployments. The educational technology program, the school of art and design, the school of engineering, the engineering technology department, and the department of forensic anthropology were using 3D printers in their pedagogy. These printers ranged in price from lower-level printers (costing several hundred dollars and used for teaching K–12 education students) to multimillion dollar setups in the forensic anthropology department. The use case scenarios for these 3D printer installations varied widely. The school of education was training future teachers in 3D printer skills as a method for motivating K–12 students in the STEM disciplines. The idea was that it is much easier to interest younger students in learning higher-end math concepts and software skills if a 3D-printed Yoda doll or spider ring is the reward. The school of art and design used 3D printers for jewelry and metalworking classes, in which students created molds and project design prototypes. The engineering school and engineering technology department were interested in helping their students translate 2D computer-assisted design (CAD) drawings into 3D prototypes of objects such as auto parts. Using a 3D printed model in a learning environment has similarities to creating a first draft of a research paper. By printing out a prototype, students may better see errors that can be corrected before printing out a revised final version. In the process, students gain skills that may have direct application in future jobs. For example, in the forensic anthropology department, students scanned and printed out copies of human skulls, which they may use in future casework or courtroom work. To unearth such use cases in your own environment, interview the principals already working with 3D printers on your campus. Current users may provide clues about printer specifications. At Texas State, we found that the school of education and the school of art and design wanted their students to have 24hour access to a high-quality one. However, engineering and forensic anthropology wanted to use a less expensive printer so that their students can prototype on a more cost-efficient basis. This input helped the selection committee spec out the initial printer purchase so that it could serve a variety of use case requirements (see the light blue box in Figure 1). Pedagogically, the idea was to place the printer in a collocated library learning commons, or third space, so that users from various disciplines could meet and mingle, leveraging strengths and expertise from various disciplines. Use cases for the 3D printer would not be restricted to specific disciplines or even classes, but as with 2D printers, use would be left open to the entire community. In carrying out the environmental scan, it surfaced that other university areas that did not presently have a 3D printer (geography and STEM disciplines) were actively interested in having access to one on campus for various reasons, including surface morphology mapping and water table models. As an analytic tool, the preliminary environmental scan was a useful one for understanding campus needs (e.g., environmental scan: tinyurl.com/mgkkc6e). These types of scans and needs assessments can also spark wider campus discussions and help define next steps for moving an initiative forward. After conducting the environmental scan and gaining approval from library senior management, the next step was to put together a selection committee. Ideally, we felt it should comprise both technology experts and individuals representing the various user perspectives. We divided committee members into 3D printer selection and 3D printer policy and infrastructure subcommittees. The goal of the 3D printer selection subcommittee was to choose a suitable 3D printer, based on the requirements identified in the environmental scan. The budget (Figure 2) included such items as extended warranties, extra extruders (print heads), computers to run the printer, a 3D scanner, 3D software, printer filament, and file-conversion software to support various users and uses (see this presentation for further selection details: tinyurl.com/pcsogw8). Because there is a profusion of 3D printers on the market, it was useful for the selection subcommittee to chart various 3D printers on a cost/quality matrix (see Figure 1). Generally speaking, as the cost of a 3D printer rises, quality also goes up. For selecting a 3D printer, the primary factors to consider are resolution (the higher and finer detailed, the better) and speed (the faster, the better, since the time for printing larger objects may limit availability). To inform our selection process, we overlaid data for the existing university printers on the chart, from a low-end unit currently in the school of education (less than $2,000 printer) to the high-end model used in forensic anthropology ($100,000–plus printer). The blue quadrant in Figure 1 represented a middle ground that would serve many stakeholders. The selection subcommittee was not merely involved in picking the 3D printer but also in making decisions about the infrastructure that would be necessary to meet user needs. In our environmental scan, we found that in addition to a 3D printer, most practitioners also identified the need for a 3D scanner. To run both of these devices, two PCs with robust processors and large amounts of memory were needed, along with suitable lab space to house the equipment. Software would also be important for creating 3D models from scratch and for converting file formats that users might bring in from their own 3D software. 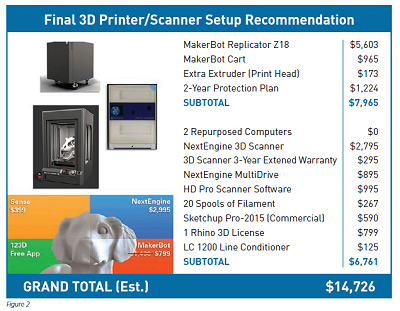 Finally, 3D printers need supplies—most notably, filament—that a supplies budget be available. The committee used a prototyping model commonly employed in learning commons operations. The prototype approach is based on the philosophy that one should not linger in making a decision, but act quickly, be agile, and take an iterative approach. So we wanted to choose a 3D printer fairly fast as a prototype and see how it worked or didn’t work in practice. If a model needed to be changed, or was found to be unsuitable, the selection could be adjusted later. Since the market is changing rapidly, with prices falling, this type of cautious approach was best. The prototype approach would be a first step toward a larger 3D printing lab initiative. Another important aspect of setting up a 3D printer infrastructure in a college campus library is to give thought to policy and service questions. If you are thinking of following our lead, ask yourself these questions: Where will your 3D printer be placed? What will the human resource structure be for staffing it? Will the printer be self-serve, or will in-house staffers be allocated (or reallocated) in order to develop skills for these new types of devices and methodologies? Will student workers be used, and/or will users be allowed to process jobs themselves? How will the filament for the printer be paid for? Will there be a cost-recovery model, or will university IT incur this expense? To think about and answer these questions, we put together a separate subcommittee to prepare a preliminary report and set some baselines. It’s always good to remember that the wheel does not always need to be reinvented. The initial environmental scan revealed that the school of art and design—which was an early adopter on our campus—had already developed a good cost-recovery model. It could be built on and modified for our lab prototype. Faculty members who may already be 3D printing experts may also be leveraged to give workshops and share expertise with the campus community. The same affordances can be found on any campus. As a final word of advice, both committees—while composed separately—should meet often together to compare notes and ensure that selection choices are in line with service models. Currently, a MakerBot Replicator Z18 and associated infrastructure have been purchased along with other recommended peripherals for Texas State. Various service subcommittee suggestions are also being implemented for an official December 2015 launch. A soft launch is already rolled out to resolve preliminary kinks. Once final processes are worked out, a more widely announced campus marketing campaign will take place. By 2016, evaluation of the 3D printer and services will begin. The next stage will be an examination of the prototype infrastructure from perspectives of what is working and what is not. This evaluation and assessment will be used as the basis for contemplating the next steps for implementing an entire 3D printing lab. By following some of these pragmatic steps, any university, library, or college campus can get started in the emergent area of 3D printing for their academic community. A visual presentation with further examples of the Texas State University 3D printer selection process is available here: tinyurl.com/pcsogw8. Ray Uzwyshyn (ruzwyshyn@txstate.edu), Ph.D., M.B.A., M.L.I.S., is director of collections and digital services for Texas State Univerity Libraries.